If you are a gadget freak, chances are you’re reading Popular Science. In fact, it might be your most favorite technology magazine. Did you know that Popular Science has been around for 137 years already? Now, here’s the good news, Pop Sci the web wing of Popular Science has already scanned the entire issues of the magazine and has put up the archives available on the internet. By archives, I mean digital archives. 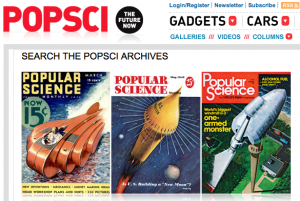 The project was in close collaboration of PopSci with Google Books. The Popular Science Archives is freely available on this site. The moment the home page loads on your web browser, you’d immediately notice a simple search box. That search box is your only way of getting into specific issues of the magazine. A cool feature of this archive is the fact that it even has the original advertisements that appeared on when the magazine issue was released. The online archives does not allow you to go into specific issues of the magazine except for the instance when you are brought to specific issues via the search function. It would have been better if a browse option is available though especially if you have not particular topic in mind and you just want to look back at what’s hip and cool in technology of bygone years.